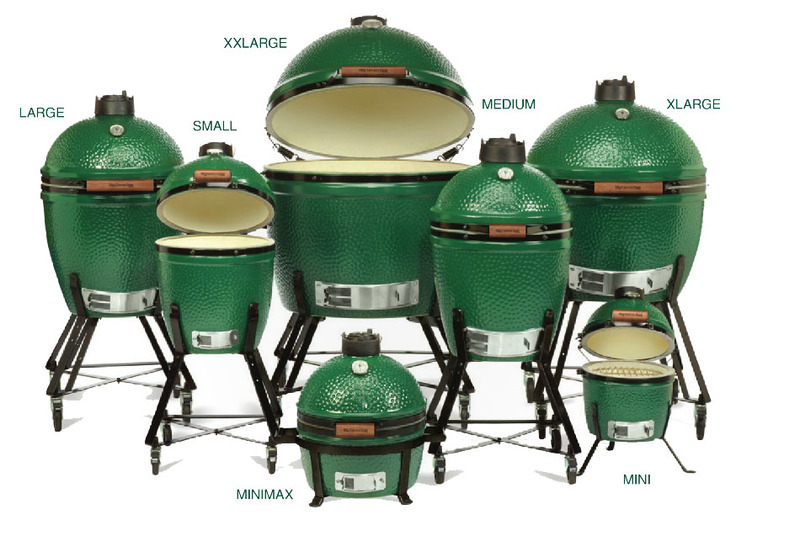 There are 7 models of The Big Green Egg. For most people, I recommend the large size. This size tends to work great for those cooking for 2-5 people on the regular and lends itself to a lot of versatility when cooking. When deciding on an Egg, keep in mind that you can cook a little food on a large Egg, but you cannot cook a large amount of food on a small or mini Egg. Also, if you can afford it, don’t choose a smaller size simply because it is cheaper. It is very common for people to purchase a smaller Egg, only to decide they need to purchase a larger size within months of owning it. In fact, many Eggheads own 3 or 4 Eggs! (I own 6 Eggs myself!) Regarding fuel-efficiency, size does not have a major impact on charcoal consumption, and even the large Eggs can burn for hours with very little charcoal. 18 ¼” 30″ 21″ 162 lbs. 15+ lbs. 15″ 26″ 18″ 113 lbs. 12-15 lbs. 13″ 22″ 16″ 80 lbs. 10-12 lbs.